Prototype: 3 different Royal Prussian Railroad Administration (K.P.E.V.) freight cars. The cars look as they did in Era I. One (1) coal gas car for transporting coal gas, one (1) Association Design boxcar based on Part A1 of the German State Railroad Car Association, one (1) beer refrigerator car painted and lettered for the brewery Lorenz Pfannenberg Söhne, Zerbst, Germany. 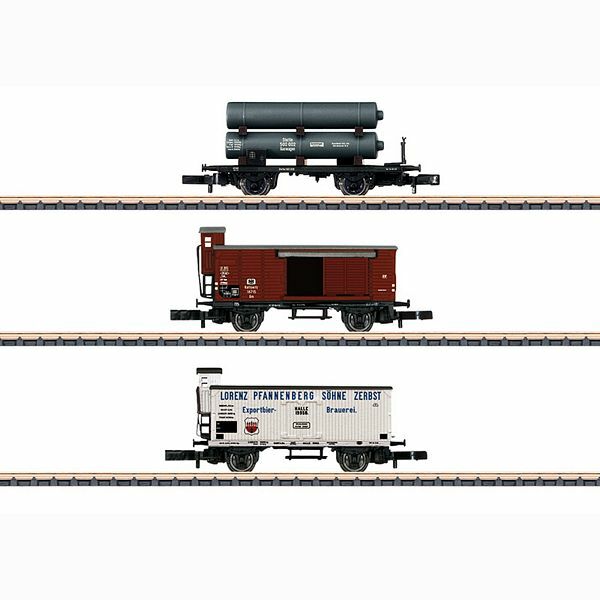 Model: The set consists of one (1) coal gas car, one (1) Association Design boxcar with a brakeman's cab and finely detailed doors that can be opened. One (1) beer refrigerator car painted and lettered for the brewery Pfannenberg. All of the cars have black nickel-plated wheels. The cars are not available individually. Total length over the buffers approximately 122 mm / 4-13/16".